We were unable to achieve agreement of kappa>=0.75 between the original DHS wealth index and a simplified index using our standard simplification process (detailed in this article). Using a revised approach, detailed below, high agreement (kappa>=0.75 for both urban and national indices) was achieved. The data used to identify important variables comes from the factor weights released by ICF. 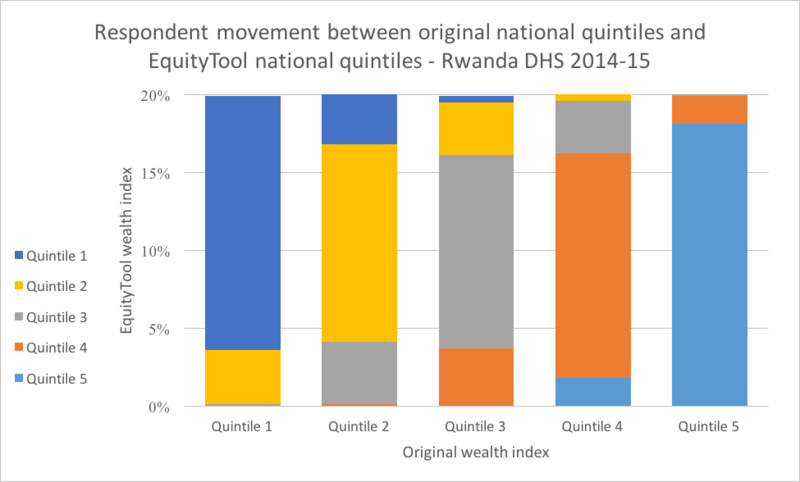 We were unable to achieve a reduction in questions or an agreement of kappa>=0.75 between the original DHS wealth index quintiles and quintiles created using factor weights from the 'Common' tab of ICF's factor weight file for Rwanda DHS 2014-15. The factor weights in the common tab come from an analysis of the national population, and contain only those variables which are related to the construct of wealth in the same way in both rural and urban areas. These variables are usually used in EquityTools to calculate national quintiles, as they reduce some known areas of respondent error in the survey. To overcome this problem of low agreement, we instead used the factor weights from the rural and urban tabs, which select variables that relate to wealth differently in urban and rural areas. For example, in an urban area, ownership of chickens may be associated with being relatively poor, while in rural areas, it may be associated with being relatively wealthy. This is the case in Rwanda. Selection of variables specific to urban and rural areas is already provided in the factor weight file. A short list of variables, common to both urban and rural areas, are iteratively selected to find those which result in high agreement (kappa>=0.75) against the original wealth index quintiles for national and urban populations. For Rwanda, the scores for urban and rural residents were combined into a national score using linear regression, in a process similar to that used by ICF. Specifically, a score from the simplified index for urban residents (Uscore) was regressed against the wealth index score variable in the dataset (HV271), the same was done for rural residents (Rscore), and the resulting coefficients are used to create a single national score (NatScore). Where Urban=1 if respondent lives in urban area and 0 if otherwise, and Rural =1 if respondent lives in rural area and 0 if otherwise. Respondents quintile assignments resulting from NatScore, the national wealth index score created from a simplified list of questions, were compared to the quintile assignments resulting from the original wealth index with 126 variables using the kappa statistic. The questions in the simplified index which resulted from this process differ from our standard approach in two important ways. First, the index for Rwanda includes questions on livestock ownership. Their inclusion was essential to create a reliable index, but responding to these questions may not be easy for all potential respondents, or when outside of the house. Since skipping a question is not advisable in this shortened list, we suggest asking a respondent to make their best guess from the choices provided, if they are unsure of a response. Second, we need to know whether the respondent lives in an urban or rural area. An additional question was added to the EquityTool: 'DETERMINE IF THE RESPONDENT LIVES IN AN URBAN OR RURAL AREA'. In principle, the definition of 'urban' and 'rural' should match the definition used in the Rwanda DHS 2014-15. In reality, the user needs to decide how to determine if each respondent lives in an urban or rural area. Three approaches are presented below, with some notes on each. Whichever method is chosen, it should be uniformly applied across all surveys conducted. Ask the respondent directly – 'is your home in an urban or rural area'. This relies on the respondent's understanding of what 'urban' and 'rural' is. Allow the data collector to determine, based on guidance provided. This will work best if interviews take place in or very near to people's homes, and if the data collectors can be trained on the same rules to determine if an area is urban or rural. One example of a rule is to classify 'peri-urban' areas on the edges of a city or town as urban. Another rule might be to classify an area as urban if it has a market center which operates daily. If the interviews are taking place outside the home, then classify respondents based upon the location of the interview. For example, if interviews occur in health facilities, classify respondents as urban if the facilities are located in urban areas. Individuals may travel, so this method is also subject to error. The graph below illustrates the difference between the EquityTool generated index and the full DHS wealth index. Among all of those people (20% of the population) originally identified as being in the poorest quintile, approximately 82.5% are still identified as being in the poorest quintile when we use the simplified index. However, approximately 17.5% of people are now classified as being in Quintile 2. From a practical standpoint, all of these people are relatively poor. Yet, it is worthwhile to understand that the simplified index of 15 questions produces results that are not identical to using all 37 questions in the original survey. This tool provides information on relative wealth – 'ranking' respondents within the national or urban population. The most recent available data from the WorldBank indicates that 60.3% of people in Rwanda live below $1.90/day. This information can be used to put relative wealth into context. People who live in urban areas are more likely to be wealthy. 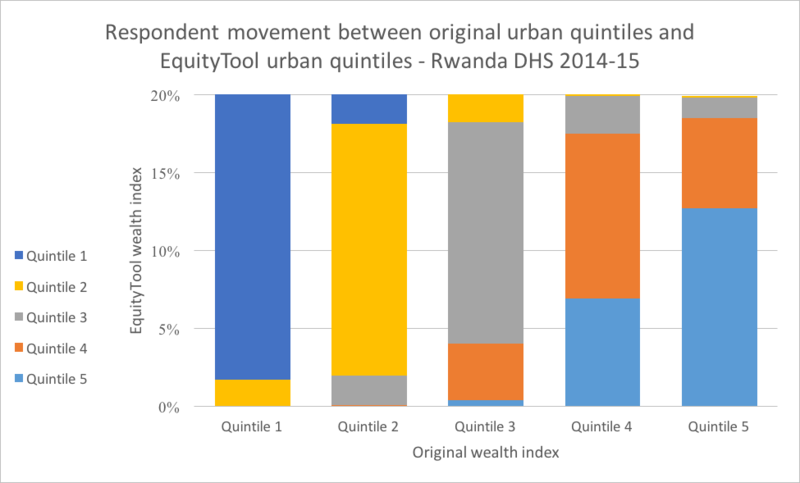 In Rwanda, 75.2% of people living in urban areas are in the richest national quintile, compared to only 8.9% of those living in rural areas. If you want results for rural residents only in comparison to other rural dwellers, contact the EquityTool support team to receive instructions on how to do this calculation yourself. 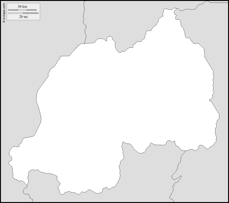 Some districts in Rwanda are wealthier than others. It is important to understand the country context when interpreting your results.